The most requested drink, and the most drunk and among the most popular in Italy and beyond: coffee. How to present it and serve it at the bar or restaurant to do justice to black gold? Here are our 12 suggestions! First rule: to prepare a great coffee, undoubtedly. Better, if possible, if it is ground just before doing the actual drink, and only when there is the need, in order to get a great product. It is very important to make sure of the good operation of the coffee machine and the cleaning of its components: the filter holder should be cleaned at every coffee and also the steam nozzle every time the milk is frothed, in order to avoid coffee with a bad taste. Be careful also to the internal and external cleaning of the grinder-doser! Fill the cup by two thirds and make sure not to mess the edge of the cup or the saucer. A good service includes one quick coffee preparation. Many people drinks it quickly, others prefer to taste it, but the speed of preparation is fundamental. In the same way the time interval to serve must be fast in order to prevent the drink cooling down. Serve the coffee into one preheated cup which allows to keep the drink warm longer. 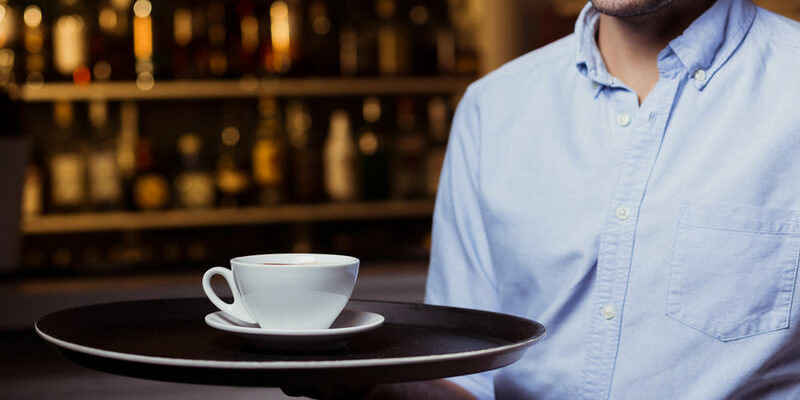 Serve the coffee at the counter or at the table always with the saucer placing the handle of the cup to the left and the spoon to the right of the cup with the handle of the latter towards the customer. Customers are pleased to find on the saucer a good small chocolate treat to be enjoyed before or after the coffee. Always serve a glass of water together: a good connoisseur will drink it first to savour the full aroma of the drink, but many prefer to drink water after the coffee. It must be still water because the sparkling could “anesthetise” the taste buds. Especially in the morning, during breakfast time, and if it is served at the table, it is advisable to accompany the coffee with a jug of hot milk. Always offer a friendly smile and guarantee maximum courtesy; tips for choosing a product or a particular or seasonal flavour are always appreciated. Taste frequently your coffee to make sure of its quality. Drinking a coffee is an experience and the type of cup used is also part of it. Do not neglect the cup and the saucer that must be nice aesthetically, handy and in style with the place. Make sure that your cups are always impeccable, clean and bright. Choose well your dishwasher and do not forget that cups and teaspoons must be cleaned to avoid spoiling the coffee fragrance and the experience of your customer! Instead, if the coffee is a “take away”, think of an original and practical packaging! Krupps thinks about the brightness of the cups for your coffee!